Is Gn15 an isotope of Germanium? 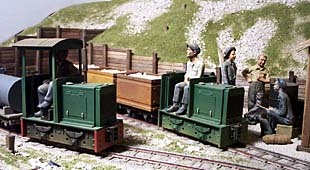 We hear a lot about “Gn15 scale” these days, and we see layouts being drawn for that scale (on this site, for example, see the Micro Layout Design Gallery). But we seldom actually see any Gn15 trains running on layouts! Here are some recent pictures to fill that gap. 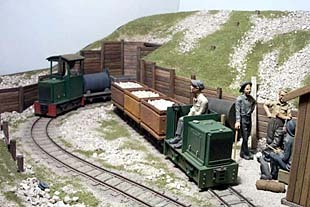 Steve Bennett has created a delightful demonstration layout in 1;24 scale using 16.5mm gauge…here are some pictures. The layout is 3’x1′ (90 x 30 cm), and all rolling stock is from Steve’s Sidelines Models. The figures are from Supply Line Models. There’s still time to build a holiday line! As a reminder, here’s a picture of a Holiday centerpiece (see Page 5 for more). There’s still time to sharpen the saw, cut some foam, and get down to creating your own holiday table decoration! You’ll feel better for doing it, your family will be glad you did, and the Small Layout Scrapbook will benefit from the pictures you take and send to us! 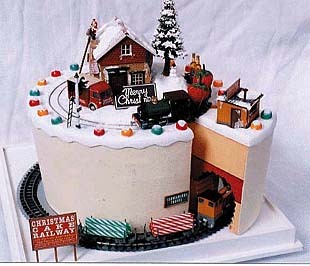 he HOn30 Christmas Cake Railway was created by Akihiro Morohoshi, and you can see more of it at his website. Notice the profusion of small details, which are the trademark of Japanese craftsmanship. In this case, the upper deck features St. Nick attempting the chimney while a steam train hauls some luscious giant strawberries to the holiday table. The lower level is dieselized and pulls candy striped “logs” from the forest to your family. The layout is a foot square (300×300 mm). So You Think Zn2 is small? Have a gander at what a seriously small layout looks like! 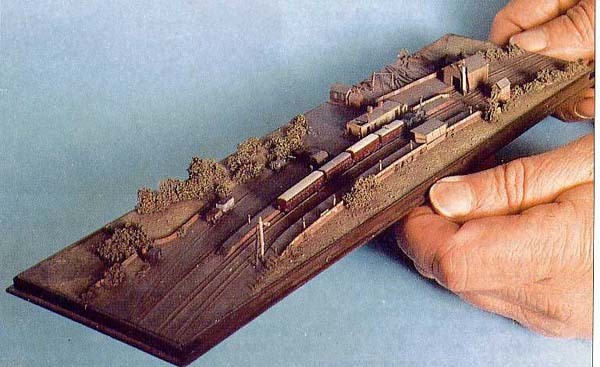 This photograph is not a fake … on the other hand, the layout does not actually run — it’s a 1:240 scale mockup of a proposed English layout module. Had you there for a second, didn’t I? New clues in Ohio Mystery! A return visit to Burton, Ohio — home of the “mystery 15″ gauge line” (see Page 1) — revealed more information about the little railroad, but did not solve the case! 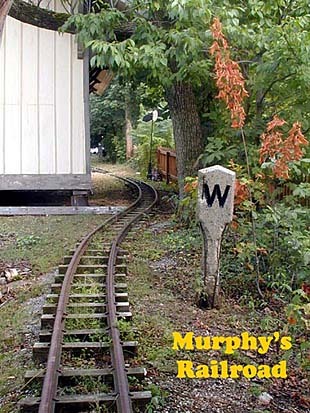 We now know the line is named “Murphy’s Railroad” and is owned and operated by one man, presumably Mr. Murphy. He was not present, nor was the line’s locomotive which he takes home with him at night! So on this visit I obtained only shots of trackage. We’re currently tracking down Mr. Murphy, so to speak. Left — a nice view looking east to the station. Below, left — Beyond the station, looking west at the passing siding with carriages stowed. 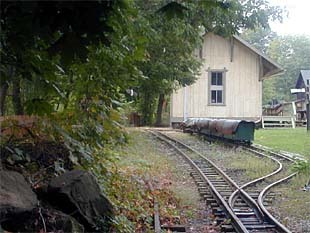 Below, right — Eastern end of track is a loading ramp for the line’s steam loco. 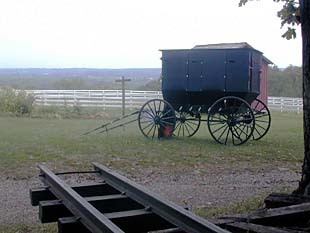 Amish carriage parked nearby.